In the beginning of every year 60 percent of us make New Year’s resolutions but it seems like we’re a bit too ambitious when setting our goals as only 8 percent of us actually achieve them (and yes, each year I’m one of the non-achievers). Not surprisingly, the most common resolutions this year are to eat healthier (71%), exercise more (65%), lose weight (54%), and spend less (32%) - the exact same ‘most common New Year’s resolutions’ as last year and the year before that. If your New Year’s resolutions are among the most common ones and you also struggle to reach your goals, here’s three ways Google Maps can help you achieve them. Whether you’re exercising to get in shape, lose weight, or explore the nature, Google Maps can make it easier for you if you enjoy the two-wheeled type of exercise. By selecting the terrain map and turning on the cycling layer in Google Maps, you can explore the bike paths of your neighborhood or discover new trails in other parts of the world. If you prefer to create your route from home you can use Directions to enter your start position and add destinations along the route. This way you can check the distance of a route and get the estimated time spent. The dark green lines show dedicated bike trails and paths without cars, green lines show streets with dedicated bike lanes, and dashed green lines show other streets recommended for cycling. The bicycling tool is only available in the web application. To turn it on, go to the menu in the top left and choose Terrain and Bicycling. If you prefer a trip to the gym over outdoor exercise Google Maps can still help you stick to your new workout routine as long as your gym offers fitness equipment with Google Maps built-in or as a module. With Google Maps on your treadmill you can take an outdoor run inside. Just choose a route anywhere in the world and you’ll see the route on the built-in tablet in front of you while the treadmill adapts the angle to match the elevation of your route. You can also record your runs to track progress, share them with friends, and compare your time to others. It may seem silly to go to the gym for an “outside” run but you’re actually more likely to stick to your workout routine if it’s fun, social, and immersive. 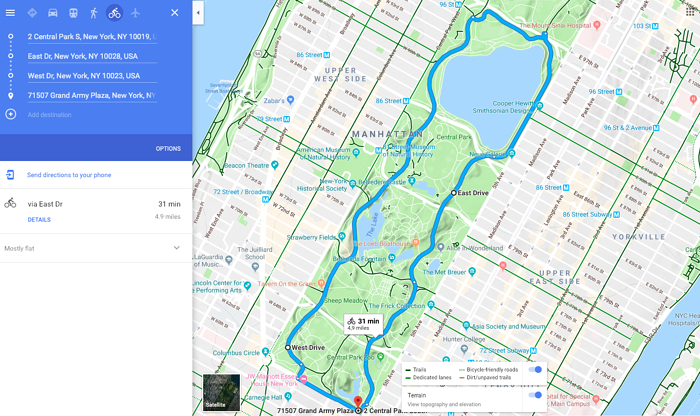 Last year Google released the new Explore tab in Google Maps that lets you explore your neighborhood and the places you visit and it’s an excellent tool if you’re looking for healthy or cheap lunch. The Explore tab automatically shows you restaurants, bars, and attractions nearby but if you’re going away for the weekend, just drag the map to where you’re going and Maps will recommend you places in that area. If you’re looking for something specific like a healthy lunch or cheap eats you can use the search field in the top. Type in what you’re looking for and Google Maps will show you a list of nearby eateries that match your search. It even shows you reviews and estimate your match based on other places you’ve visited or reviewed. Good luck with your New Year’s resolutions and don’t forget to check out our blog if you want the latest and greatest about Google Maps.